The part of the xAPI community that loves the freedom to live outside of an LMS, the vast majority of it, loves cmi5. They just don’t know it yet. This is the story of how I came back to an LMS, after having never really used one. The story about a little specification that took forever, but in the end provides a wandering community with just enough fencing to get them back on a path. But the part they’ll really like — it can be any path. Don’t think of the LMS as an LMS, instead, think of it as a “cmi5 launching” system. It turns out that in practice, so many of the clients I was working with had these systems that told their learners what types of learning and training they should be participating in. These clients were excited about xAPI, and they were already bringing their learners to the list of tasks available to them. cmi5 is providing a standard way to handle this across different systems and experiences. 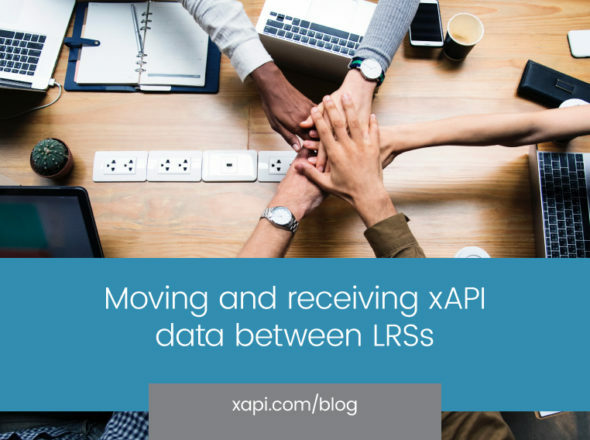 Presuming you have your endpoint and credential problem solved and the data is flowing into your LRS from your content, as well as from all your other xAPI-enabled sources, then the next problem hits — the xAPI flexibility problem. This is the problem that an xAPI recipe was initially intended to solve. A consumer of xAPI data needs to have a way to identify the semantic meaning of a statement as a whole so that it can “understand” that statement. cmi5 pays particularly close attention to this concept and provides a means to identify statements with specific cmi5 meaning that the launching system (or any reporting system) can use to frame the context. Beyond specific cmi5 statements, it provides a templating system for how other statements can include basic information, allowing all of the statements in an experience to be tied together efficiently. Although sometimes we prefer a path less taken, most often we want a well worn path with a pre-defined destination. Spelling out how to detect and use a cmi5 statement in a massive pile of data makes it much easier to develop and much faster to execute for the reporting system. I work with and on eLearning standards every day, particularly xAPI, and despite the best efforts of the community to date, it feels like gaining widespread adoption of profiles and recipes has been a slow, uphill push. The thing that I found, however, is that every non-trivial type of experience we want to explain with profiles and recipes all start with the actor “initialized something” and end with the actor “finished something,” and it didn’t matter what the “something” was. The session concept in cmi5 has these markers and can provide a shell for other profiles and recipes that are defined in the future to live inside of. There is no reason for anyone else to worry about how to create those types of statements and indicate these types of events. We can just wrap them in cmi5. So far, a lot of adoption of xAPI has been from people that love to trailblaze, and they are critical to the process. But for every one of them, there are lots of people that like to start on a well traveled path, take small excursions into the thick, and then return to that comfortable path. cmi5 is perfect for both because it allows you to send nearly any statement you want (yeah, yeah, not voided; I said nearly). You can stick to the well defined statements associated with common LMS concepts such as completion, success (pass/fail) and score, or you can use cmi5’s concept of “allowed” statements which is virtually any other statement. You can have your cmi5 content send statements across several different profile types, or invent your own. The amazing thing about a path is that it is exciting for each new traveler, even though inherently none of it is new. The reason to love cmi5 is that all of these fundamental concepts necessary to start making robust end-to-end applications of xAPI have been codified in one succinct specification by original pioneers in the xAPI community. We’ve had four years of xAPI wandering, and now it is time for LMSs, rapid authoring tools and less traditional eLearning platforms to all find a path to success. cmi5 can be that path. Questions about how this stuff works? Reach out to us.